To date, Benchmark's Optical Fibre Training Systems have trained over a million engineering students – from all over the world. Benchmark's Optical Fibre Training solutions are in use in North America, the UK, the Middle East, South Asia, South East Asia and China. Fibre Optics have revolutionised the way the world communicates today. Optical fibre based communications systems are working today in the Telecom, Railways, Defence, Industrial Automation and Medical industries or sectors. Fibre optic training has, therefore, assumed great importance in this scenario of widespread usage of fibre optic technology. Potential entrants into this technological field have to be well versed and equipped to work with large-scale, real world, fibre optic systems. In order to train these potential entrants effectively, it becomes critical to set up "state-of-the-art" equipped labs at reasonable costs. A task that gets further compounded when one weighs in the various permutations and combinations that setting up such a fibre optic laboratory entails. 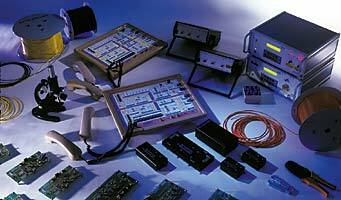 For, apart from having to identify the required equipment and components, one has to ensure perfect compatibility between components, availability of spares and replenishments, expandability and the sourcing of all this, most often, from multiple vendors – all to be achieved within a limited budget. Finally, at the end of this this difficult exercise there is still no guarantee of full compatibility, support or even cost effectiveness. This is where Benchmark Electronic Systems steps in. Benchmark provides a complete single-source solution to all the above parameters or aggravations. It offers a complete range of products and spares, starting from individual Optical Fibre Trainers to versatile and comprehensive Optical Fibre Laboratory Systems. A product range that encompasses a comprehensive list of accessories from cables to links and connectors, power sources to power meters... all guaranteed to be not just compatible but completely upgradeable. And backed by a range of options for training personnel / students in optical fibre concepts and practices. Benchmark, in fact, guarantees that students can start working in the laboratory right from the day one.